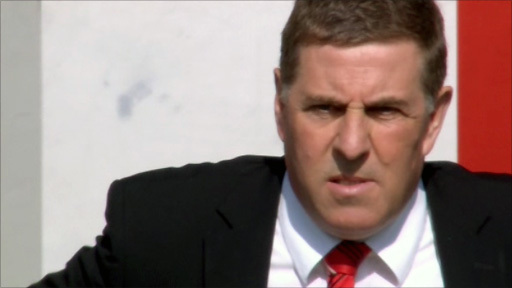 Mark McGhee has been sacked as manager of Aberdeen with the 53-year-old's side sitting second bottom of the Scottish Premier League table. The Dons said on their website that McGhee and assistants Scott Leitch and Colin Meldrum "have left the club". McGhee, who took charge in June 2009, survived a record 9-0 defeat by Celtic on 6 November, after which the club's board backed him to continue. But their 2-0 loss to Kilmarnock on Saturday was their sixth in succession. And the Dons' announcement came a couple of hours after the SPL decided that all the weekend's fixtures, including Celtic's visit to Pittodrie, were being postponed because of the severe weather. Aberdeen's next fixture is away to Hearts on 11 December, but chairman Stewart Milne has not set a timescale for a permanent appointment. Terry Butcher, who has led Inverness Caledonian Thistle to promotion and who now lie fourth in the SPL, has already been strongly linked with the vacancy, as has former Aberdeen midfielder Gordon Strachan, unemployed after leaving Middlesbrough. But less costly options like former Hibernian manager John Hughes, ex-St Mirren boss Gus MacPherson, or Scotland Under-21 coach Billy Stark are more realistic targets. Speculation will also link Jimmy Calderwood, who was McGhee's predecessor, with a return to Pittodrie. Milne, who will shortly announce details of interim arrangements, said: "On behalf of everyone at the club, I would like to thank Mark, Scott and Colin for their time at Aberdeen." Sandy Clark, who was coach at Pittodrie under Calderwood, was surprised that Aberdeen had taken so long to part with McGhee and doubted whether there is enough will within Pittodrie to bring the former manager back. "If things are not going right, results are poor, gates are dropping, the players don't seem to be responding, the manager goes," he told BBC Scotland. "Mark's been lucky in that it has dragged on for a few weeks when everyone expected him to go a few weeks back and, if you are perfectly frank, it simply hasn't worked since Mark took over from Jimmy Calderwood. "In a lot of ways, I think Jimmy would go back as he enjoyed his time there, but I don't think certain people within the board have got the guts to go back and ask him. "Personally, I don't think I would want to go back, but you never know in football. "Who decided to appoint Mark McGhee and who decided to sack Jimmy Calderwood? If that has a common denominator then, whoever that person might be, they have seriously got to have a look at themself." Jim Leighton, who was goalkeeping coach under Calderwood, thought that the former boss would jump at the chance to return, having left Kilmarnock in the summer. "Everybody has to look forward and hopefully we can get the right man because relegation was a serious option," said the former Scotland international. "I spoke to Jimmy just a couple of days ago and I know how bored and fed up he is. If Jimmy did get it and he asked me to go back, I would be delighted to." McGhee had an up and down record as a manager with Reading, Leicester, Wolves, Millwall and Brighton, but he was highly praised for leading unfashionable Motherwell to a third-place finish in his first season in charge of the SPL club. It led to a switch to Aberdeen, where he had played in the side that defeated Real Madrid to lift the European Cup-winners' Cup in 1983. He had been chosen to succeed Calderwood, who had lost the support of the Dons board despite the former Dunfermline boss leading his side to a Europa League qualifying place. McGhee's tenure began with an 8-1 aggregate defeat - their heaviest ever in Europe - to Czech outfit Sigma Olomouc and they ended the season in ninth place in the SPL. Following this season's humiliating defeat by Celtic, lengthy discussions were held between McGhee and the board. Despite strong indications that the manager was about to be sacked, he remained in post with both sides stressing their determination to improve both on and off the park. However, the poor run of results continued as the Dons failed to find the net during defeats by Rangers, St Johnstone and Kilmarnock. Only goal difference now keeps them above Hamilton at the foot of the table and McGhee departs, following Wednesday's board meeting, as their least successful manager since they were formed in 1903, with a win percentage of 27%.